If you love cool fashion that's versatile and on trend with no compromise on quality - you'll love the Apricot catalogue. Apricot is a fashion brand for women that is designed to be timeless with its focus on interesting prints and fabrics from all over the world. This is where you will discover gorgeous styles that you won't find anywhere else. The Apricot brand was launched in 2007, and has skyrocketed in popularity since then, with hundreds of department store concessions in the UK and worldwide, its own high street stores, and a thriving and easy to use online store. Whether you want jazzy and sassy party wear or a classy and refined work look for the office - Apricot has got you covered. Not only for the grand and sparkly social occasions either, with both Apricot Life and Apricot Basic Essentials to help kit you out for the gym and for when you're kicking back in the comfort of your home - you will look and feel stylish all day long. Get inspired with all types of dresses and accessories to compliment your looks perfectly - you'll always find your outfit happiness with Apricot. For yourself or another, Apricot offers gift cards too which can be purchased for any value. Send directly to the recipient of your choice - this is one great last minute gift! How do I use my Apricot discount code? Other discounts which don't require a code will be applied automatically. Sign up for email news from Apricot to get 15% off of your first order. You'll also keep up to date with the latest news and sale information from the brand! Where is my nearest Apricot retailer? Use the helpful store locator facility on the Apricot website to find out where your nearest concession or store is. Apricot offers 10% student discount, plus free delivery when you have a student discount code. Return items in their original condition within 28 days. Items bought online must be returned via the post. Alternatively, contact them through Twitter or Facebook Messenger. 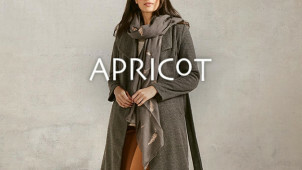 Apricot is a trending women's fashion brand that has established a huge fanbase in the UK since its launch in 2007. Offering beautiful and luxurious clothing for work, evening and the daytime too, use an Apricot discount code from vouchercloud and whatever the season, you will be able to expand your wardrobe for less. Apricot has stunning dresses, gorgeous coats and fantastic accessories for all occasions so now you can enjoy unique and interesting styles, whatever your budget. As well as Apricot online and Apricot stores, you can also find the beautiful collections in the concession stores. You'll find this star brand in selected Debenhams, House of Fraser, New Look stores and more dotted around the UK. So it's easy to get the Apricot style whenever you are, just check using the online Store Locator to find your nearest high-street branch. While Apricot sells stunning styles for all occasions, one of its most notable offerings is definitely its collection of dresses. Whether you want the perfect look as a wedding guest, something unique and interesting to wear for a big night out, or a sophisticated day look for work - for less with the Apricot voucher codes - you can find some beautiful designs at that won't cost you the Earth! Combine them with the great accessories also available from the brand and you can create looks you will love for every occasion.